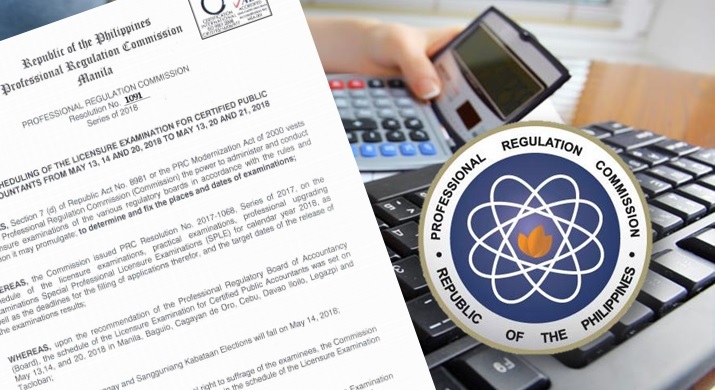 MANILA, Philippines - The Professional Regulation Commission (PRC) on Wednesday, announces the rescheduling of the May 13, 14 and 20, 2018 Licensure Examination for Certified Public Accountant (CPA) in Manila, Baguio, Cagayan de Oro, Cebu, Davao, Iloilo, Legazpi and Tacloban to May 13, 20 and 21, 2018, pursuant to PRC Resolution 1091 Series of 2018. The change in examination schedule was due to the Barangay and Sangguniang Kabataan Elections which fall on May 14, 2018. "For the May 2018 CPA Licensure Examination, the Notice of Admission (NOA) previously issued and containing the original schedule can be used and will be accepted by the proctors," PRC said. "Moreover, conditional examinees are not required to resubmit the documents needed to apply for examination but they will be required to present to the Application Division the Notice of Admission (NOA) previously issued, or report of rating or verification slip from Records Division," the commission added. Hi this is PRC reschedules May 2018 CPA board exam blog I am reading. how many blog do you have? I wanna read. Guardians of the schoolkids should empower them to pick subjects excitedly in light of the way that, kids need to analyze those www.lorwriting.com/see-our-letter-of-recommendation-examples/ books till the end. I truly reinforce those gatekeepers who make such strolls and make the conceivable fate of their children progressively merry and amazing. I concur with your statement about thriving's tremendousness for people as you cleared up well in this article. Individuals can't discover different critical clues about success from some other article since, I settled on a learn this here now decision about that you have proclaimed a great deal of supportive signs.